How many tickets do you exchange a month? What if you could gain a full work day back with all the extra time you'd receive if that process was automated. Well for every 50 tickets exchanged with Automated Exchanges, one full day of manpower can be saved. Automated Exchanges gives you the highest level of repricing automation to calculate complex fare, tax and penalty information on exchanges. SEARCH AND RE-PRICE AUTOMATICALLY for up to 80% of ticket exchanges. INCREASE TICKETING PRODUCTIVITY up to 20% and save up to 20 minutes per exchange. REMOVE DUPLICATE WORKFLOWS by checking the best exchange and new ticket pricing at same time. 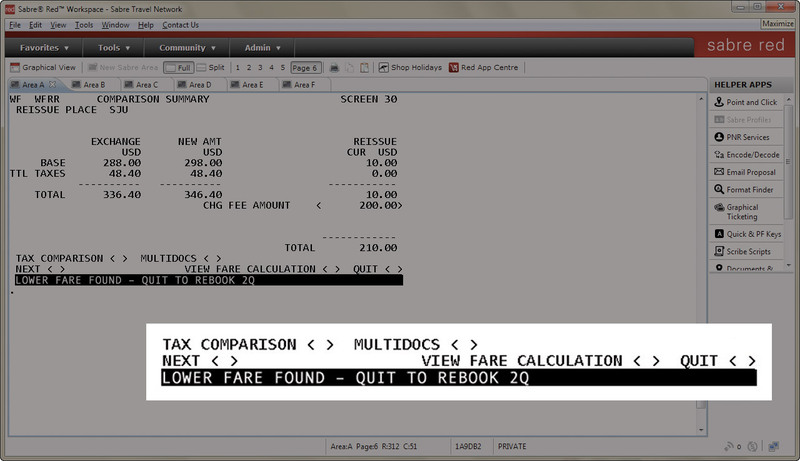 AVOID HUMAN ERROR AND REDUCE DEBIT MEMOS as Automated Exchanges are included in the Sabre Fare Guarantee Policy. IMPROVE CUSTOMER SERVICE AND INCREASE TIME FOR MORE SALES by removing the complexity in the exchange process. AUTOMATICALLY KNOW WHICH OPTION IS BETTER for your travelers as Sabre is the only technology provider to proactively tell you this. Sometimes that will be a ticket exchange, and sometimes buying a new ticket is cheaper. Automated Exchanges simultaneously checks both options and advises with a banner message if a new ticket is cheaper. Then simply choose: reissue or buy. CHECK THE EXCHANGE PRICE AT NO CHARGE as Sabre does not levy a fee. The Automated Exchanges pricing model is based on completed exchanges, allowing you to easily map cost to revenues. PROTECT AGENCY REVENUES AND IMPROVE CUSTOMER SERVICE with the addition of Automated Exchanges. Around 80% of an agent’s ticket exchanges can qualify for quicker and easier processing using the Voluntary Changes rule. You can then expect up to 20% improvement in your overall ticketing productivity, and up to 20 minutes saved per exchange. USE THE HIGHEST LEVEL OF AUTOMATION to calculate complex fare, tax and penalty information on reissues, expediting and adding accuracy to the process. Original ticket information is retrieved, removing the need for complex cyptic entries. And electronic coupon status is verified to ensure accurate processing. MAKE YOUR LIFE EASIER with many features of Automated Exchanges. A “Best Price Exchange” automatically rebooks tickets into other classes to secure the lowest price. Search the lowest price reissue options for price conscious customers. See detailed marketing intelligence and productivity reporting on all tickets exchanged in an Automated Exchanges Report. And protect your revenue as transactions are included in the Sabre Fare Guarantee Policy. Only Sabre alerts you when a lower fare is available during your exchange process.